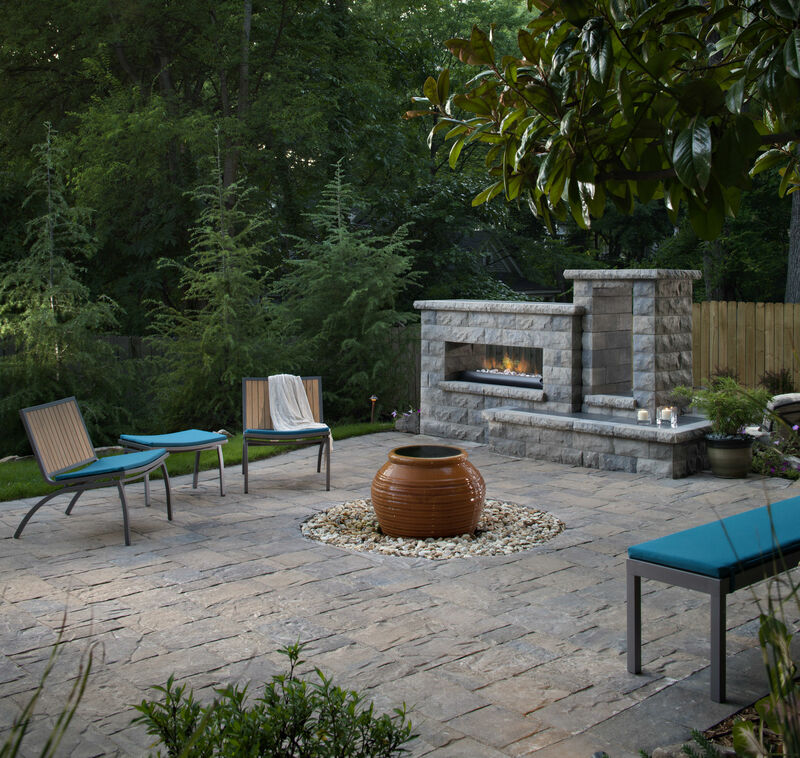 A patio fireplace is one of the most requested features when homeowners are designing or updating their outdoor living areas. 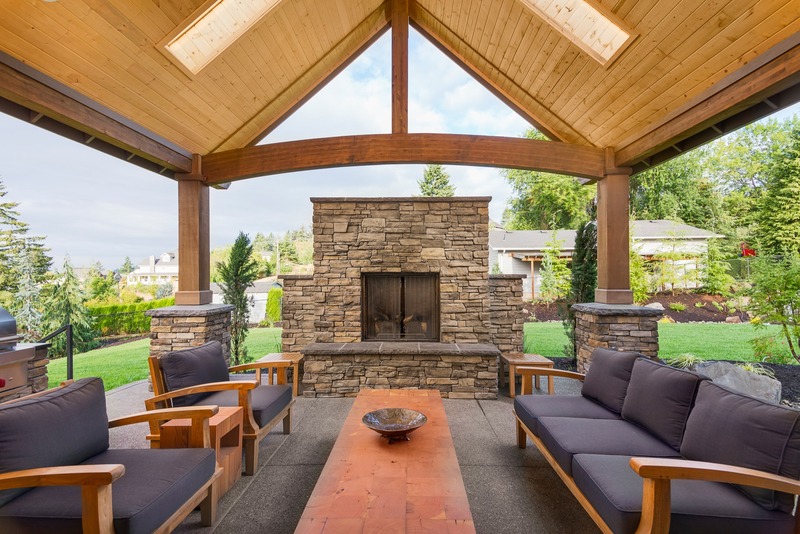 The growing popularity of fire features is no surprise, since this attractive addition completely changes the atmosphere of your patio and creates a welcoming, warm, more intimate environment for entertaining. Of course, any time you introduce a fire feature, you increase the risk for unwanted fires or injuries, but this can be largely managed by following simple safety guidelines to protect people, pets and your property. This patio fireplace safety guide can help reduce the risk of fires and injuries and specifically addresses safety tips for installed, outdoor fireplaces. For backyard fire pit safety and maintenance tips, go here. For safety tips regarding portable ethanol fireplaces, check out this fire safety tip sheet from the National Fire Protection Association. 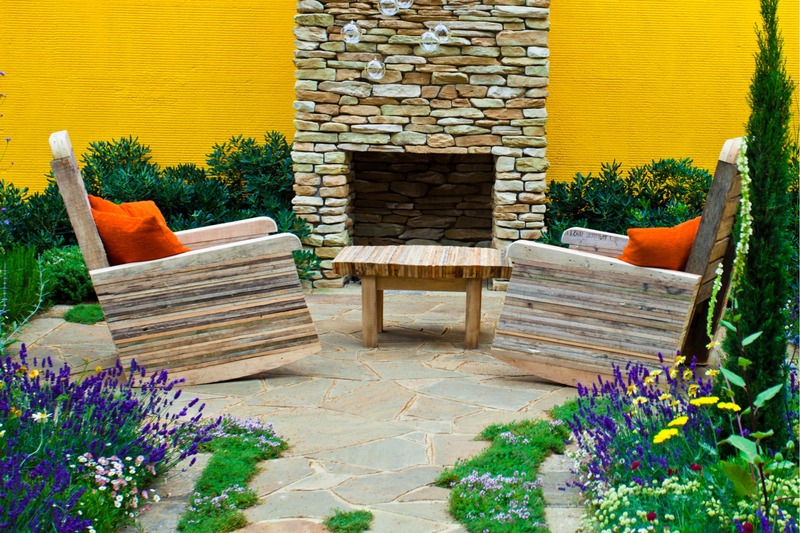 If you need inspiration for an outdoor fireplace, take a look at our outdoor fireplace ideas! 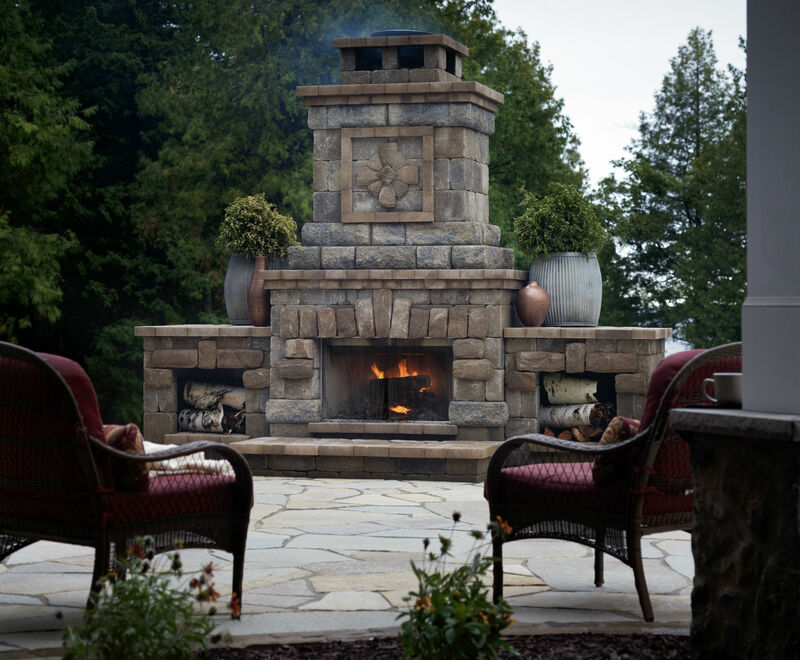 Here are five things you should do before installing a fireplace on your patio or in other outdoor living areas. Check your local governing body and your homeowners association (if applicable) to make sure outdoor fireplaces are allowed where you live and to find out about any ordinances regulating their installation and usage. If your area had burn bans, you will need to find a local website you can check to make sure there is not a burn ban in place before using your fireplace. If you will be installing your fireplace in an enclosed or partially enclosed outdoor living area, talk to your contractor about proper ventilation to avoid a potential health hazard. 3. Choose the location with safety in mind. Your patio fireplace should be located at least 10 feet away from structures and flammable materials. When this is not possible, such as in the case of a patio with a wood cover or a mature tree growing nearby, you will need to take additional precautions to reduce fire risks. 4. Purchase safety equipment prior to installation. Purchase a Class A fire extinguisher and a safety screen prior to installation. This way, you will not be tempted to use your outdoor fireplace before you have this important safety equipment on site. Even if your fireplace comes with a glass front or glass doors, consider purchasing a screen to place in front of the glass to reduce the risk of injury. Once you have purchased a fire extinguisher, make sure you know how to use it and maintain the recommended service schedule. 5. Hire an experienced contractor. There are patio fireplace kits available that offer an affordable, attractive option for installing an outdoor fireplace. These kits can be installed as a do-it-yourself project but, unless you are a contractor or very handy, we recommend hiring an experienced contractor to ensure that the fireplace is installed properly and to benefit from his or her knowledge. A contractor can help you make sure there is proper ventilation, choose the safest location for your fireplace, make sure your chimney and firebox are properly installed and functioning, and make recommendations that can reduce fire hazards. It is even more important to hire a professional if you plan on installing a gas fireplace, since this will require running a gas line to the location and properly hooking up the gas line to the fireplace. 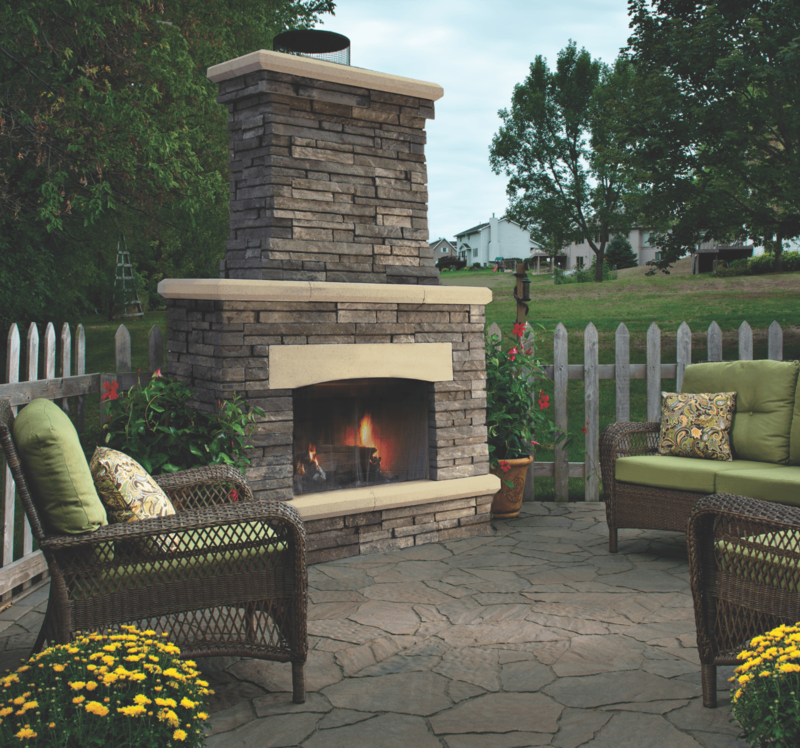 Once you have installed your patio fireplace, it is now time to enjoy it with your family and friends. To help make sure you can safely incorporate your fire feature into your outdoor entertaining activities, here are 13 tips for safer use of outdoor fireplaces. 1. Keep debris and yard waste away from your fireplace. Dead leaves, twigs, branches, dead grass and other yard debris can pose a serious fire hazard if not cleared away from fire features. Make sure there is at least a 10-foot area cleared of all yard waste on all sides of your patio fireplace. 2. Regularly prune nearby trees, shrubs and bushes. Avoid low-hanging branches and shrubs growing too close to your fireplace by regularly pruning plants and trees near your fire feature. 3. Always use a fireplace screen. Fireplace safety screens can keep sparks and embers from starting fires outside of the firebox, discourage guests from throwing trash, cigarette butts or other materials into the fire, and help to keep kids and pets safer. Even if you have glass doors or a solid, glass front, always use a safety screen placed in front of it as a physical barrier to reduce the risk of your children, pets or guests getting burnt on the hot glass. 4. Keep children and pets at least three feet away from your outdoor fireplace. Children and pets should always be kept at least three feet away from outdoor fireplaces to help keep them safe. Even if you have a safety screen or glass doors to provide a barrier, these materials can get hot; therefore, it is important that children and animals do not tough them. 5. Never leave the fire unattended. Patio fireplaces create a relaxing, welcoming ambiance for outdoor entertaining, but it only takes a second for things to get out of hand. If you are heading inside to make another round of drinks or check on the next course for your dinner party, be sure to put someone in charge of keeping an eye on the fire. Even with a screen to catch errant sparks and embers, something could slip through and start a fire outside of the firebox. 6. Keep emergency supplies on hand. If your fire grows too large, gets out of control or escapes the firebox, you will need to have emergency supplies on hand that you can quickly and easily access. This can be as simple as a garden hose, bucket of sand, buckets of water or a fire extinguisher. 7. Use appropriately sized logs. If you have a wood-burning patio fireplace, always use logs that can easily fit inside the firebox. All of your kindling, logs and any other materials you plan on burning should fit completely inside the firebox to help ensure a safer fire. 8. Do not use lighter fluid or other accelerants. Lighter fluid, gasoline, kerosene and other accelerants are unnecessary and unsafe. They can easily cause flareups or can result in your fire suddenly getting out of control. You can start your fire with fire starters or kindling, such as twigs or crumpled paper. It is generally considered safer to use fire starters, since crumbled paper can be easily picked up by even a gentle breeze and carried away from the firebox. 9. Burn only intended fuels in your fireplace. Do not burn anything in your outdoor fireplace other than the intended fuel and kindling. Treated wood, glossy magazines, cardboard boxes with colored printing and similar materials can release toxins into the air when burned. 10. Store your firewood away from your fireplace and structures. While it is convenient to keep your firewood within reach of your patio fireplace, this can increase fire risk. The Federal Emergency Management Agency (FEMA) recommends storing firewood at least 30 feet away from structures, which includes your home, gardens sheds, fences and patio structures. Some backyards may not be large enough to allow for firewood storage at this distance; in these cases, store your firewood as far away as possible from structures and fire features. Taking a few extra steps to retrieve additional logs to keep your fire going is well worth it to reduce fire risk. 11. Keep patio furniture three feet away from the fireplace. 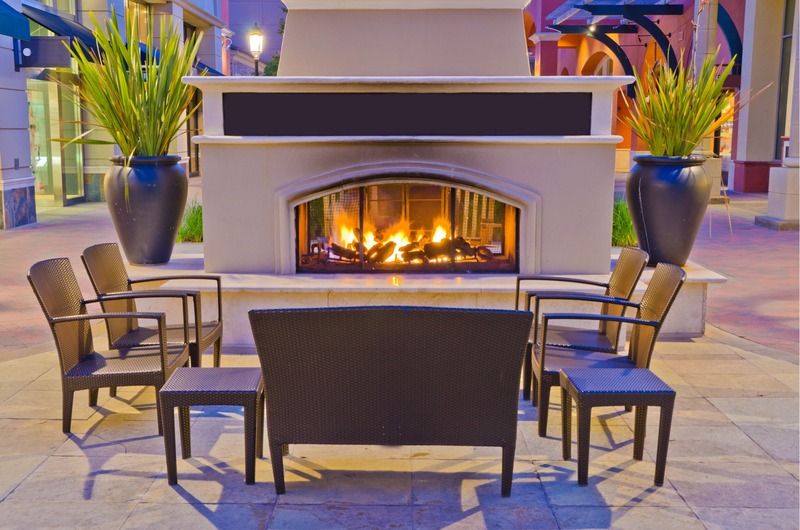 Patio furniture and all other flammable objects should be kept at least three feet away from your outdoor fireplace. This can reduce the chance of a wayward ember catching your patio cushions on fire, while also helping to keep your guests as safe distance from the fire. 12. Always extinguish your fire at the end of the night. There are two ways that most folks take care of the fire in their patio fireplace as the evening draws to a close. One way folks handle this is to simply allow the fire to burn out on its own as they clean up inside or get ready for bed. The other common thing folks do is to throw a bucket or two of water on the fire to put it out. Neither of these are effective ways to ensure your fire is safely extinguished. The first option – allowing it to die on its own – means leaving your fire unattended, which is never a good idea. It is impossible to know whether or not it might gain strength or flare up, which could happen even long after you have gone inside. So, this is not a viable option. Throwing water on the fire may seem like a good idea, particularly since that is one option for putting out a fire that has gotten out of control. However, there is more than one reason why you should not throw buckets of water on a fire in an outdoor fireplace. The first problem with this is that simply dumping water on a fire does not guarantee that it will be extinguished. It may look like you have gotten the fire completely out, but embers burning beneath the wood or ashes could flare up later. Also, throwing water on a fire in a ceramic firebox could cause it to crack, while regularly throwing water into a metal firebox can cause it to rust. The best way to put out a wood fire is to allow it to naturally burn out and use most of the fuel in your firebox. Once the flames and embers have gone out, spread the ashes around in your fireplace to encourage the ashes to cool. Once the ashes have cooled, slowly pour a small amount of water on the ashes to extinguish any embers you may have missed. Continue to slowly pour water on the ashes until there is no longer steam rising from them. 13. 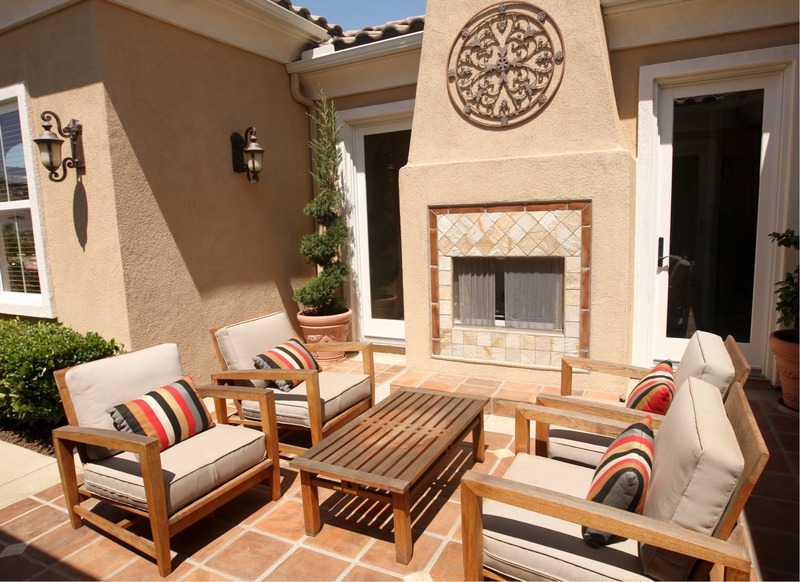 Regularly maintain and clean your patio fireplace. The Hearth, Patio & Barbecue Association (HPBA) recommends having your chimney professionally inspected every year and to have it cleaned, if needed. It is particularly important to make sure there are no obstructions or creosote, either of which could cause a chimney fire. This annual inspection should also include checking the firebox for cracks or damage, as well as checking the exterior of your fireplace for structural integrity. If you have a gas fireplace, the inspection should also include checking the gas lines, checking for condensation, and cleaning the burner and control compartment. The HPBA also recommends clearing the ashes of previous fires before lighting a new fire in your patio fireplace. Once your ashes have completely cooled, you can use a broom or brush to sweep them out of the firebox into a fireproof container, such as a metal ash can. Metal fireplace screens can be cleaned with soapy water and a scrub brush. Glass fronts can be cleaned with a water-vinegar mixture and paper towels when there is not much soot present. If there is soot, you may need to use soapy water and a sponge to scrub the glass clean. Make sure your glass is completely cooled off before cleaning it.